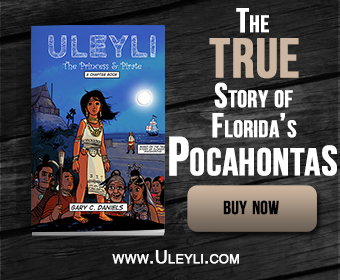 “When the French landed in Florida on their second voyage under Laudonniire, that leader went on shore with five and twenty arquebusiers, after obtaining a safe-conduct from the Indians, who had gathered in crowds to see them. 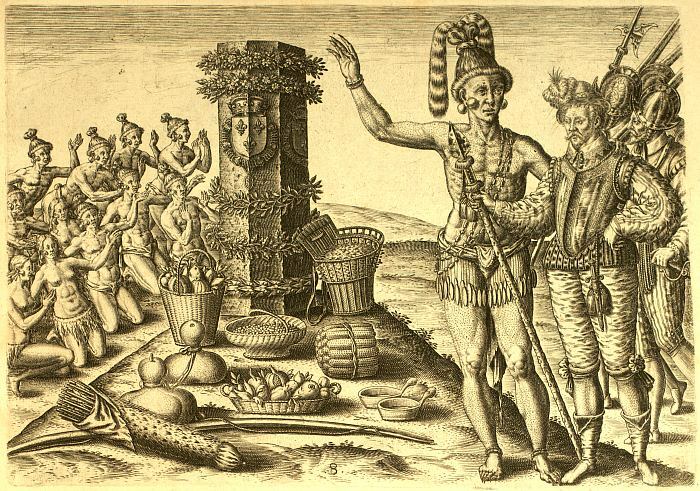 The chief Athore, who lived four or five miles from the seashore, also came ; and after an exchange of presents had been made, accompanied by demonstrations of all manner of kind feeling, the chief gave them to understand that he wished to show them something remarkable, and that he desired they would go with him for that purpose. To this consent was given ; although, as the chief had with him a great number of his people, caution and circumspection were used. He then conducted them directly to the island where Ribaud had set up on a mound a stone column ornamented with the arms of the king of France. On approaching^ they found that these Indians were worshipping this stone as an idol ; and the chief himself, having saluted it with signs of reverence such as his subjects were in the habit of showing to himself, kissed it. His men followed his example^ and we were invited to do the same. Before the monument there lay various offerings of the fruits, and edible or medicinal roots, growing thereabouts ; vessels of perfumed oils ; a bow, and arrows ; and it was wreathed around from top to bottom with flowers of all sorts, and boughs of the trees esteemed choicest. After witnessing these ceremonies of these poor savages, our men returned to their companions, and set about choosing a place for erecting a fort.